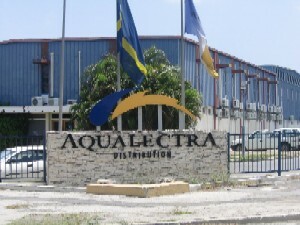 WILLEMSTAD – More problems for the embattled utility company Aqualectra. The employees could not enter the plant because the doors were locked. Presumably, the employees did these themselves because they are angry about the collective agreement with the management of the utility. Yesterday was the deadline for the unions’ ultimatum. However, the management announced in a letter that they will stick to their points brought forth during the several meetings they had with the unions. The unions and the company’s management could not agree on a new collective agreement and this is the reason for the employees to go on strike. If the management persists and there is no agreement that means that the employees will have to give in on their social benefits. According the union STKO, through its spokesman, Cedric Hudson only the employees at Nieuwe Haven (Dokweg) are on strike but apparently all the clients service centers are also closed. “Everyone depends on Aqualectra and if we need to sacrifice, then we should jointly look for solutions. Not only need the employees to sacrifice, also the government and everybody else,” Hudson said.